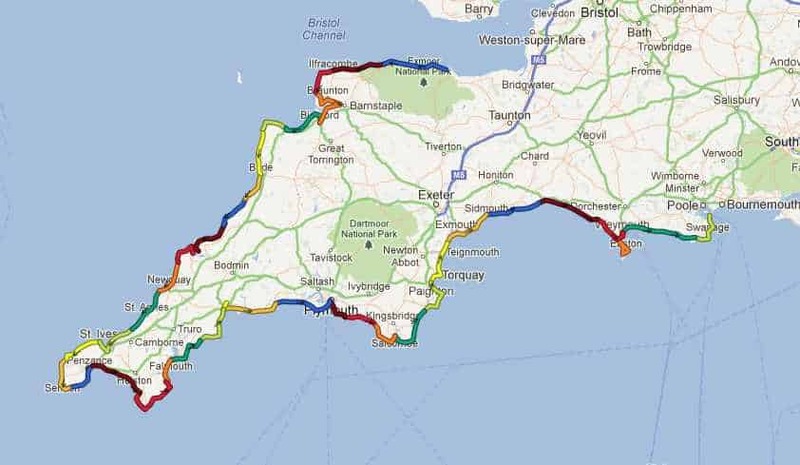 My map of The South West Coast Path from my tracks. Here is a map that Adze generated from all the data (about 70Mb) that my GPS collected each day as I walked the South West Coast Path, Adze displays each day walked as a different colour. Adze gives the following data: Total distance 1102.98km, duration 307 hours, distance climbed 47.6 km, max gradient 48 degrees, maximum elevation 486.56 metres. I would love to make the map zoomable, if any map techies are out there know how to do it or are willing to write a plugin, can you please get in touch with me 🙂 As it is, clicking the map should download a kml file that hopefully will display in Google Earth.